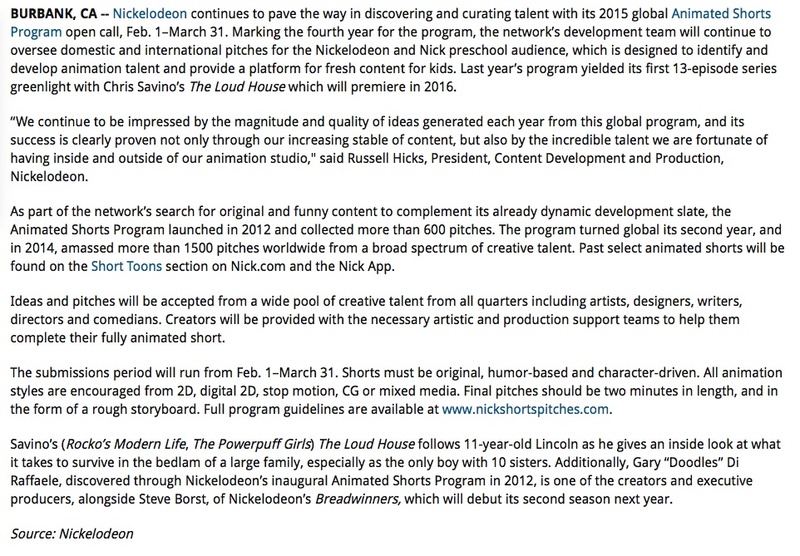 Back in December, Nickelodeon did a PR blast for its annual Global Animated Shorts program, which got picked up by the news media, bloggers and the like. The program makes it possible for people around the world to pitch ideas for original animated content for kids, for a chance at getting one’s very own show on Nickelodeon or Nick Jr. Even though the submission period for the program would not open up until February 1st, Nickelodeon’s PR team wisely worked to get the word out two months in advance. The submissions period will run from Feb 1 – March 31. Shorts must be original, humor-based and character-driven. All animation styles are encouraged from 2D digital, 2D stop motion, CG or mixed media. Final pitches should be two minutes in length and in the form of a rough storyboard. Full program guidelines are available at http://www.nickshortspitches.com. So much for the correct use of the present tense. Have you ever heard the expression, s/he’s pretty but there’s not a whole lot going on upstairs? For such a simplistic landing page, there is SO much wrong with it. We’d love for you to apply! …Except if have a visual or motor disability that requires you to use a screen reader in order to try to read the copy embedded in an image, which a screen reader can’t do without the aid of alt text. Unfortunately, the only alt text we’ve provided for this copy-heavy image is “Nickelodeon Shorts Program,” which isn’t helpful in the least. So, um, yeah, sorry about that. We just didn’t have the professional integrity or human decency to type the actual words as alt text… or better yet, to just add them as straight HTML layered on top of the funky cool image. ‘Cus, you know, putting up an image on top of an image on a web page is HELLA HARD. Companies have been sued for having pages that are inaccessible to consumers with disabilities. And even if this debacle of a landing page never results in a lawsuit against Nickelodeon, implementing the most basic of accessibility standards — text as HTML, descriptive alt text for images — is Web Dev 101. I mean, it’s PRETTY DAMN LAZY of Team Nick to post a text-heavy image on top of a background image on an HTML web page — especially for a page that is trying to reach creatives all over the world. I hope they didn’t getting paid overtime to produce such amateurish work. What on earth is the purpose of blasting out a press release that drives traffic to a landing page that is nothing more than a Ya’ll come back now, ya hear! billboard? Not only is that obnoxious, but it’s terrible UX. A web page should almost always have a primary and immediate call-to-action (CTA). “Come back on January 12th,” is woefully passive and not at all immediate. It’s akin to having an eCommerce website with gloriously-designed product detail pages that are bereft of Buy or Add to Cart buttons. Instead, to order a product, a consumer has to send a letter and a bank check via snail mail to a P.O. Box address. Even though the submission period had not begun yet, there were several CTAs Team Nick could have included on this landing page to engage and inform the people who made the effort to click through and visit this page. Included a Remind Me submission form in which interested parties could submit their email address and/or mobile phone number to receive an alert when the program details were posted and, later, when the submission period opened. Not only would this have provided a great user experience, but it also would have been a quick and easy way to collect the email addresses / phone numbers of animation enthusiasts and potential future employees. Embedded a video playlist of the animated shorts that were created during previous years of the Program, such as The Loud House, which Nickelodeon had recently picked up as a series for 2016. Encouraged people to follow Nickelodeon Animation Studio on Facebook, Twitter, Tumblr, etc. All three of these CTA examples are no-brainers and would have been oh so simple to implement (if one wasn’t totally and completely lazy, that is). Problem #3: Missing Your Own Damned Deadline! Interested parties who reminded themselves to return to the Animated Shorts 2015 landing page on January 12th were deflated to discover that the page was PRESTO NO-CHANGE-O. I mean, seriously Team Nick, how did you manage to miss a deadline that you SET FOR YOURSELF? A deadline you PUBLICLY announced an entire month before? And why on Earth did it take you three days to revise just 3 words; providing EVEN LESS information than before? The Animated Shorts 2015 landing page is rife with so many rookie mistakes, you’d think it was the work of a middle school intern, not a team of well-paid digital professionals. The level of laziness Team Nick has demonstrated thus far on this landing page is BEYOND EMBARRASSING. Here’s hoping they manage to update the page with ACTUAL INFORMATION on or before February 1, when the pitch submission period begins. And that all of that information won’t be embedded in a massive image file.